Are you tall? This 90' Boundless yacht for sale has a ton of headroom! : Atlantic Yacht & Ship, Inc.
Are you tall? This 90′ Boundless yacht for sale has a ton of headroom! This 90′ Boundless yacht for sale must be sold as soon as possible! Furthermore, the owner is willing to consider a real estate trade for it. In the first place Boundless yachts has created a new generation of boats. In a word they were designed with fun and freedom as the prime criteria. Of course, exploring the islands, cruising the intracoastal, traveling off shore, wherever! The Boundless will take you there with speed and in style. Triple jet propulsion will increase economy of operation as the need for speed and maneuverability change (keep in mind that also means that this yacht has joystick control for maneuvering)! In summary she is sea worthy in 6′ seas or moored as a primary home. There is no other yacht built today with so many features for today’s yachtsman. Moreover there is stunning headroom throughout. This makes for an extremely comfortable layout and house-like feel. 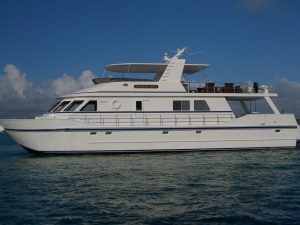 As can be seen this is the perfect boat for live aboard or charter. All in all this yacht deal was built in the United States. Similarly she is US flagged, has a minimal draft of 2.5 feet, and only 400 original hours. In a word this yacht is ready to go! For more information on how to trade real estate for this 90′ Boundless contact Randy Kires today! Want to trade real estate for a yacht? See this 90′ Boundless!